It’s no secret that cycling and just training in general can wreak havoc on the body. Long hours in the saddle in a somewhat-limited-movement-position that often focuses on the legs more than anything else can really lead to some aches and pains. Working on increasing or maintaining your flexibility is a key to staying comfortable on the bike. The Hatfield Sit Strap is a tool for doing just that in the lower half of the body. So, just what it is the Hatfield Sit Strap? 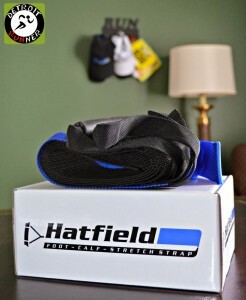 It’s a 4” nylon/polyester strap that sells for $35 through www.hatfieldstrap.com. In order to use it, you unroll it and sit on it to anchor the strap in place. Run it under your leg and over your toes, grasp the handles and apply rearward pressure, and it supplies a stretch to the foot and calf. Since you have the strap essentially in your hands, you have complete control over the amount of force applied during the stretch. The flexible nature of the strap also means that it stretches the foot more completely than the old “wall” stretch. Watch Keith Hatfield’s interview on CBS WCTV Tallahassee about his groundbreaking invention, the Hatfield Strap. Keith Hatfield developed the Hatfield Strap out of necessity. Keith has long suffered from plantar fasciitis and had purchased many devices to stretch the foot and calf and felt continually disappointed with the results he was getting. After conducting research, Keith was inspired to create his own device after personally experiencing a gap in the market. He ordered the material and cut and sewed it together, and the first time he put it on he experienced the stretch he was after all along. Everyone that tries the Hatfield Strap feels that stretch right away. A few days ago, I was able to interview Keith Hatfield, a former Royals trainer, on his time with the Royals and is latest invention, the Hatfield Strap. What years and which affiliates were you a Royals trainer? I was with them two seasons. In 1991, I did extended spring training and rookie league. In 1992, I also did extended spring training and low-A ball in Eugene, Oregon. Back then, each minor league affiliate had one trainer while the major league club had two. About a month ago, I received the Hatfield Strap for review and have been testing it ever since. 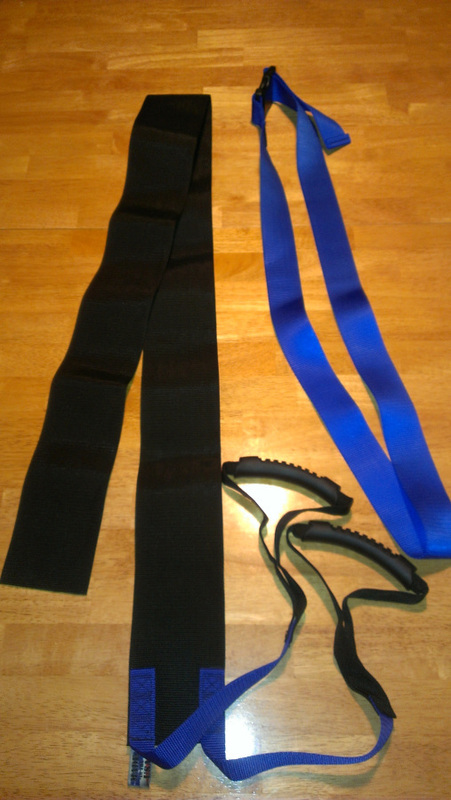 Essentially the strap is a device to help you stretch to keep you running. It targets the calf and foot and is especially good for people with plantar fasciitis. While I don’t have plantar fasciitis, it’s still good for anyone looking to stretch their legs/feet. My opinion is that by using this to stretch, it helps prevent injuries. While I cannot attest to it fixing injuries, I’ve always found that stretching helps get you back out there running.